Hannah is smart and funny, she has it all sussed out and could do with her mum getting off her back about homework and exams. Aaron is the new kid in town and is desperately trying to make friends and make his parents happy. They are both struggling with their own problems when Hannah finds out she’s pregnant, at fifteen, and she can’t disclose the father’s identity; no matter who is asking. Aaron is trying to stay under the radar but he sees a friend in need and come to the rescue, of course he’ll be the pretend baby-dad; what could possibly go wrong? Growing up can be trouble but by doing so you suddenly know the things that really matter. Oh I don’t even know where to start with this book. I sat down to read it at 5pm on a sunday evening, with one break to watch an episode of Breaking Bad with tea I was done by 11pm. It needed reading and called out to me whenever I thought ‘I’ll go do something else in a minute…’ it was nigh on impossible to put down and the range of emotions it conveyed was brilliant. Seriously if you take one thing away from reading this review its that this book needs reading. I think the storyline was brilliant, I love duel perspective books and I think in this case it worked perfectly. I loved that Aaron had his own story too, that he wasn’t just some new kid at school and the things he did were carefully thought out – most of the time! I loved that Hannah wasn’t the sl*g she made out to be and that people who judged her (and there are many) were completely wrong about her because as you read the book you get to know the real Hannah – the one who needs her family in her life, the one who actually cares about the people around her, despite her bad attitude at times. The thing I loved most about the book was probably the characterisation. Aaron is so angry and closed at the beginning of the book, he doesn’t really know his emotions properly himself and snaps at his parents and shuns their kindness and all they have done for him. As he becomes closer to Hannah and some of the other people in the book he becomes kinder and more open about things that caused him to be that way. Hannah herself opens up to the people around her more than she ever did before too and the home truths about her life before the baby really hit home. Other minor characters like Rex and a couple of the others in the school particularly seemed to grow and develop really well too. I have known the author Non in a blogger and friend capacity for a while now and I know we agree that the more difficult and taboo subjects should be covered in YA books, and that swearing should definitely be allowed too… I was so glad to see that she has carried this attitude over to her debut and that there are no holds barred in Trouble. For that reason I wouldn’t give it to anyone younger than 14 but I know I would have loved it at that age, nothing shocked me at all in the book and I loved what I read! 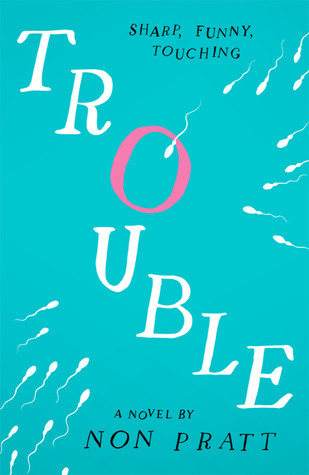 Trouble is a great book that tackles difficult subjects including pregnancy, death and judgement. I loved the seriousness of the book but I also loved that there were laughs mixed in and how you really do grow to love the characters. I can’t wait to see what Non comes up with next! Trouble will be published by Walker Books on 6th March 2014. My copy was sent to me from the publisher in exchange for an honest review.